This week, Steve Dillaman, Vice President Sales, is attending the Material Handling Equipment Distributors Association’s 62nd annual convention and exhibitor showcase in Salt Lake City. As a proud member of MHEDA, it is a great opportunity for us to get some face time with our customers and integrator partners, network and learn about new trends in the material handling industry. Steve Dillaman introducing the new Ryson Wide Trak Spiral to an integrator partner. Here, Mark Nelson, President of Nelson Equipment Company – one of our integrator partners – is learning about the new Ryson Wide Trak Spiral Conveyor. It’s the widest slat width Ryson offers and is ideal for the distribution and warehousing industries. Ryson Spiral Conveyors need less floor space than conventional conveyors and are faster and more reliable than any elevator or lift. The High Capacity Spirals are ideally suited for warehousing and order picking operations, and can optionally be configured to allow loads to enter or exit at intermediate elevations. PackExpo East will take place in Philadelphia February 27 – March 1 2017. We welcome you to visit our booth 805 to see our new equipment in operation. This year at Pack Expo we will be unveiling a new version of our Narrow Trak Spiral Conveyor. They are great space savers with high throughput. Ryson Narrow Trak Spiral Conveyors are super compact vertical conveyors designed to handle small loads. Our nesting slats have the capacity to reliably end-transfer small cartons and packages or side-transfer small bottles or containers in a single file or in a continuous mass flow. The spiral conveyors are equipped with our new 6” and 9” wide nesting slats which provide an efficient flat conveying surface without gaps. These spirals can run at speeds in excess of 200 fpm. The Narrow Trak spirals offer a significantly larger elevation change capacity than what is currently available in the small package marketplace. They are also a good alternative to side gripper conveyors because they can run at high speeds and do not need to be adjusted for varying product sizes. This compact unit is equipped with the Ryson proprietary low friction chain slat belt which assures high capacity, high speed, low energy consumption, low maintenance and long life.This new model is especially beneficial for the food, beverage, pharmaceutical, nutraceutical and personal care market. Click above for FREE Registration on us! We are happy to announce that we are able to offer you free registration to attend. The registration fee will be waived. Simply fill in the comp code “97J29” at checkout – make sure you indicate yourself as an end user. You can also check out our vertical conveying capabilities video to find out about the diversity and functionality of our product line. If you plan on attending, please stop by our booth. You may also contact us to set up a private demonstration or meeting. Find out more about Pack Expo East. Next month, Ryson will be exhibiting at Pack Expo East in Philadelphia. Not only are we excited to show off our brand new super compact Narrow Trak Spiral Conveyor with 9″ wide nesting slats, but we are also looking forward to talking with existing integrators and customers and meeting new ones. We also very pleased to announce that we are offering free registration to anyone that registers through this link. So, we invite you to come to the show on us. Hope to see you there. Click here for more information about Pack Expo East. MODEX will take place in Atlanta, April 4-7. We welcome you to visit us in booth and see our new equipment in operation. We will be unveiling our new Narrow Track Spiral Conveyor equipped with our new nesting slat that has the ability to end-transfer small cartons and packages, or side-transfer small bottles and containers in a single file or in mass at speeds in excess of 200 fpm. Also we will be running our High Capacity Spiral Conveyor with Multiple Entry and Exit capabilites allowing loads to enter or exit the High Capacity Spirals at intermediate elevations. New special induction and divert conveyors have individually adjustable conveying surfaces to match the spiral pitch, assuring a safe and reliable product transfer. 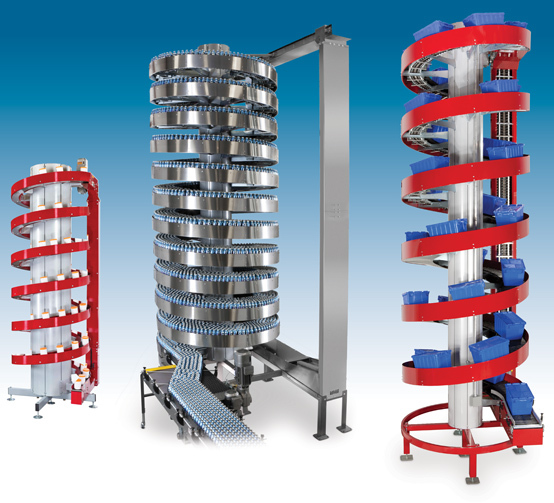 The loads can enter or exit the spirals in the up or down rotation, and offers great space-savings in multi-tiered order picking systems or multi-level production operations. PackExpo will take place in Chicago in a few weeks. We welcome you to visit our booth to see our new equipment in operation. Ryson will showcase our comprehensive family of Spiral Conveyors and broad line of Bucket Elevators. We will continually run live demonstrations at the show. We would love to set up a private demonstration for you. We are also pleased to offer free show registrations. The Ryson Comp code is 71M51 which also gives you access to the new co-located event Pharma Expo. For more information about our product line, please visit www.ryson.com. See you at the show. If you plan on attending, please stop by our booth. Contact us to set up a private demonstration or meeting. Ryson will be part of the PMMI Pavilion at FISPAL in Sao Paulo, Brazil in a few weeks. Fispal Tecnologia is an International Packaging, Processing and Logistics Trade Show for the Food and Beverage Industries. It’s the biggest and most complete event in that Latin American region. The show brings together more than 60 thousand professionals in search of machines and equipment, packaging, products and services for the industrial sector. Professionals from the areas of purchase, marketing, engineering and supplies from every region of Brazil and more than 38 countries, all brought together in the 4 days of the event. Ryson is looking forward to the opportunity to represent our company and vertical conveying solutions to this emerging market. We will be in the PMMI Pavillion in booth 235. For more information, visit the FISPAL website. This week RYSON exhibited at Modex 1014 in Atlanta. The show was well attended and we were pleased with the reception to our newest spiral in our product line – the Narrow Trak Spiral. RYSON also was running the Multiple Infeed Spiral that allows loads to enter at intermediate levels in the spiral. Ideal for multi-tiered pick modules and vertical conveying of multiple production lines with one unit. 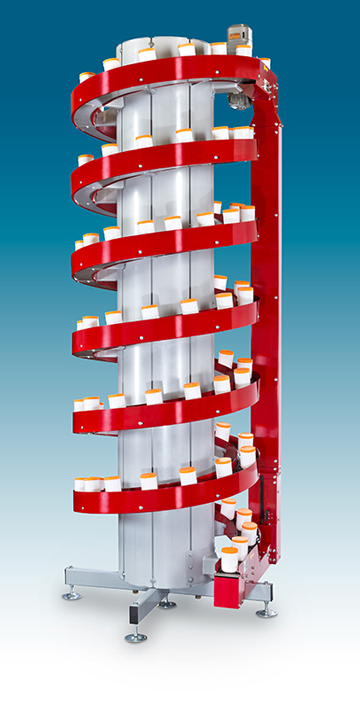 For more information about these vertical conveyors, or any other spiral in our product line, visit ryson.com.